﻿ HuntingNut » Forums » Hunting » Varmint Hunting » what gun to use for coyote? what gun to use for coyote? Posted: Sun Jan 18, 2009 12:24 pm Post subject: what gun to use for coyote? IM A DIE HARD HUNTER LOOKING FOR WHAT EVER GETS IN MY SIGHT!!!!!!!!!! Posted: Sun Jan 18, 2009 1:18 pm Post subject: Re: what gun to use for coyote? I'd use the one you shoot the best. Posted: Sun Jan 18, 2009 1:38 pm Post subject: Re: what gun to use for coyote? There's quite a few that will do the job. If your Hide hunting I wouldn't go bigger than 6mm/243. Anything much larger will blow big holes in them. Posted: Sun Jan 18, 2009 1:48 pm Post subject: Re: what gun to use for coyote? There are a lot of factors to consider when making that choice. 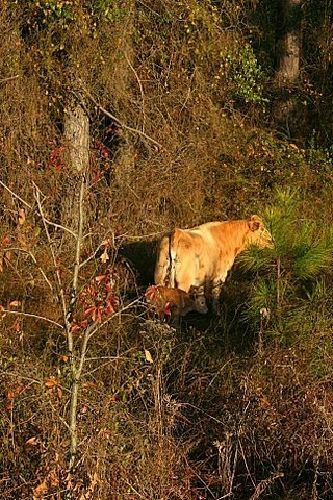 What type of area are you hunting? Open fields or tight wooded cover? 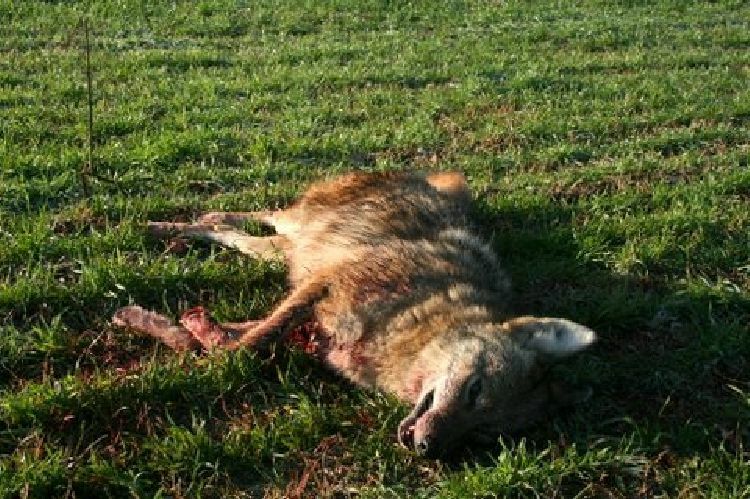 Are you interested in "regulating" coyotes or do you have a fur buyer? Tell us some more information. Posted: Mon Jan 19, 2009 12:00 pm Post subject: Re: what gun to use for coyote? I use a 6.5 x 55 Swede, but I don't save the pelts. My cousin has been using the new Barnes Varmint Grenade in his 223 WSSM and likes the fact that they do not penetrate fully ( He has not shot any beyond 100 yards). He also keep the velocity about 200 fps below "full throttle". Posted: Tue Jan 20, 2009 8:38 pm Post subject: Re: what gun to use for coyote? I like to use a shotgun, but then again I like to smell them die. Posted: Tue Jan 20, 2009 10:45 pm Post subject: Re: what gun to use for coyote? I usually take my .243 (85 gr. Sierra Gameking HBPT) or my .22-250 (52 gr. Sierra Matchking). Posted: Thu Jan 22, 2009 3:14 am Post subject: Re: what gun to use for coyote? I think either a 50 BMG or a 22 MM w/depleted uranium rounds should be fine... unless you want the pelts. Posted: Sat Jan 24, 2009 8:51 am Post subject: Re: what gun to use for coyote? World famous 22-250 Remington! 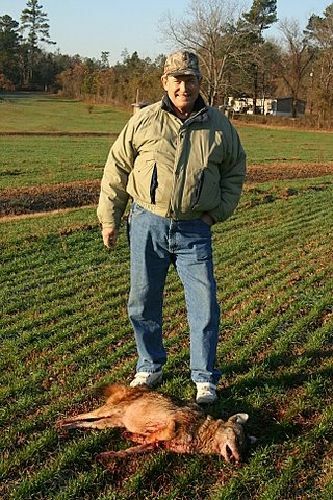 Known to bust coyotes for over 70 years now. First developed as a wildcat, dubbed the 22 Varminter. As for reloaders it is the most versitile of all the 22 centerfires, handling velocities from 1500 fps to 4500 fps. As for busting coyotes......legendary. Posted: Fri Feb 06, 2009 12:25 pm Post subject: Re: what gun to use for coyote? The FAMOUS Sir Elmer (not Fudd) once remarked that the .270 Winchester was a "damn fine coyote rifle". Of course, I think he said that just to piss off Jack O'Connor, who used it for anything up to Moose. ...How do I hunt thee? Let me count the guns...(attributed to E. Barrett (not the BMG people) Browning (Nope, not them, either.) By none other than Jim Zumbo of the LARGE "black rifle" faux pas fame. By now, you are surely getting the message. Dance with who ya brung. But where's the fun in that? Ahhh, yeeess... SCHEMING how to explain the "need" for a new varmint rifle. Posted: Fri Feb 06, 2009 2:16 pm Post subject: Re: what gun to use for coyote? pourch I saw a coyote moving out in the pasture in front of our house. up seeing me doing that shooting in my BVD's. shooting the coyote and saving the new calf. So, you will find that I usually have a 22 Hornet, 223 Rem or 22-250 Rem ready for those coyote shots of opportunity in the front yard. This shot was 203 yards and the bullet was one of the Midsouth Shooters Supply Varmint Nightmare 55 gr bullets (Hornady #2266), 3223 MV, 34.5 gr of Varget, Winchester case, CCI primer, bullet crimped with Lee Factory Crimp Die. Posted: Fri Feb 06, 2009 5:15 pm Post subject: Re: what gun to use for coyote? Posted: Sat Feb 07, 2009 2:59 am Post subject: Re: what gun to use for coyote? Good shooting Chris...you are right about laughin' mate....but I think I would have been laughin' more at the "back and forth" to the gunsafe more so than the shooting part. I can see it now...Chris in his socks and jocks, nice clean polished floors, running a 10 second 100 yds, slippin' and slidin' round the corner to get to the safe, arms and legs goin' in every direction, the missus hollerin' at him to be careful and to get dressed. Well done on saving your neighbours new calf and cow mate. I've seen the after mess of wild dogs attacking a calving dairy cow out here in aussie...very untidy. Keep an eye out for that other bugger Chris...no doubt he/she will be back. Posted: Sat May 23, 2009 5:21 am Post subject: Re: what gun to use for coyote? Back it the day, I just used what ever I had. My dear gun worked good, but blew the coyote up. I don't know if you (mulletboy) are planning to get a new gun or not. If your planning on getting a dog-gun, then a good choice is a 22-250 or a 223. "Getting a new gun" boy I really like the sound of that. Posted: Fri Jun 05, 2009 6:15 pm Post subject: Re: what gun to use for coyote? I think several have said the same but here's my .02 My first serious rifle was a ,243 ruger m77 the old style w\ tang safety, it was also the first round I reloaded for and tried just about everything under the sun. I was pretty good with it everything I shot was with that rifle, crows, yote's, chucks,deer, everything, So whenever someone asks about the best all around cartridge thats it in my book. oh yeah it was one of their lightweights and the groups on my best loads were always well under an inch. Everyones experience is unique, and your situation maybe different lightwieght noslers go 4000 and heavier 100g+ for deer work great from any angle.